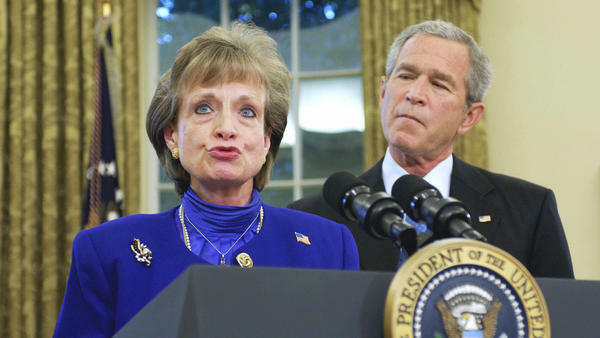 White House counsel Harriet Miers speaks after being nominated by President George W. Bush to the Supreme Court on Oct. 3, 2005. She would withdraw later that month after intense scrutiny of her qualificiations. Nationally, the big story that autumn was Hurricane Katrina, which had devastated New Orleans and much of the Gulf Coast. But it was the storm over Miers that dominated the nation's capital that October and force her to withdraw as nominee. There are two reasons that saga returned to capital conversations this week in connection with the decision to nominate Rear Adm. Ronny Jackson to run the Department of Veterans Affairs. One was that both Miers and Jackson were seen as surprising and highly personal choices who lacked conventional qualifications for the jobs in question. The second was that both Miers and Jackson were known for their strong personal connection to the president they served, who had reason to appreciate and return their loyalty. Miers had served Bush in a succession of roles beginning in 1995 during his first term as governor of Texas. Miers served as Bush's personal attorney and also most of a term as chair of the Texas Lottery Commission, resigning early in 2000 as Bush was seeking the Republican nomination for president. In January 2001, she came to Washington as assistant to the president and staff secretary. In 2003, she became deputy chief of staff for policy and, the following year, White House counsel. Eleven months later, Bush nominated her for the Supreme Court. With no time as a judge or experience with constitutional law, Miers seemed a sharp departure from other nominees in both parties in recent decades — most of whom had extensive service on the federal bench, including the U.S. Courts of Appeals. Some critics at the time suggested that Miers had won Bush's permanent gratitude by helping him handle inquiries into his military record, which included time in the Texas Air National Guard during the Vietnam War. She was also quoted calling Bush "the most brilliant man" she had ever met and the "best governor ever." But if Miers was a target for enemies of her boss, she probably suffered more from criticism on the political right. Conservative legal groups were wary of her, concerned that she was not a strong and proven jurist who could be influential in the manner of then-Justice Antonin Scalia. Senate Republicans who had not been consulted about her selection were lukewarm about it at best. (Then-Sen. Trent Lott of Mississippi said he could not "get excited about" her nomination.) She was nothing like John Roberts, who had been confirmed as the successor to Chief Justice William Rehnquist earlier that autumn. But if the Senate was unenthusiastic, conservative media commentators and talk radio hosts were far less restrained, noting that Miers had been a Democrat who gave money to other Democrats such as Al Gore as late as 1988. They questioned her views on abortion, despite her repeated public pledges of opposition to Roe v. Wade. In fact, there were rumors that she privately supported Roe, the 1973 Supreme Court decision that established a woman's constitutional right to an abortion. Her meetings with members of the Senate Judiciary Committee, who would vote first on her nomination, did not go well. She struggled with their questions about the law and elements of constitutional theory. The chairman and ranking member of the committee sent back her written questionnaire and asked for better answers. Other Republican senators went further, asking her to turn over memos she had written advising the president. At that point, the White House announced that Miers had asked to withdraw her nomination — just three weeks into the process. Bush would subsequently nominate Samuel Alito for the vacancy. Alito was confirmed in January 2006 and is a core member of the court's conservative bloc. Miers returned to the White House as legal counsel and stayed until January 2007. The story of Miers' ill-fated selection was recalled this week after Trump tweeted an announcement of Jackson as his choice to replace VA Secretary David Shulkin, who was fired. The president had been a Shulkin fan as recently as last spring, when they collaborated on legislation to overhaul the department. But the secretary's business trip to Europe later in the year included his wife and side trips that the VA inspector general called serious violations of ethics and policy. Jackson has been a career Navy physician, serving stateside and in a forward military hospital in Iraq. He has at times supervised a small staff of immediate subordinates but nothing like the 360,000 employees he will have in the VA, the second-largest federal department by number of personnel, behind the Defense Department. The VA serves more than 9 million veterans and maintains 170 medical centers and more than a thousand outpatient clinics. Jackson also evoked Miers' lavish praise of her boss in his effusive report on Trump's health in a famous news conference in January. Although he acknowledged the president could lose weight and exercise more, he said he was plenty healthy to serve one or two terms. "It's called genetics," he said. "You know, just great genes ... incredible genes." In a moment of hyperbole, Jackson said the president, with better diet, might live 200 years. These rather superficial similarities might soon be forgotten if no more consequential obstacles arise. But Jackson, like Miers, must face confirmation by the Senate, where initial reaction to his nomination was muted. Powerful senators such as Johnny Isakson, the Republican who chairs the Committee on Veterans Affairs, were public admirers and defenders of Shulkin. The former secretary also had strong support from such traditional veterans' groups as the Veterans of Foreign Wars, the Disabled American Veterans and AMVETS — all of which would be expected to have influence in the confirmation process for Shulkin's successor.